If you aspire to leadership because you want to tell people what to do, make lots of money, or be in the spotlight, get out now. Sometimes leaders do all three. Often they don’t. Successful leadership pivots on developing leaders. Leaders, who don’t develop leaders, become bottlenecks. 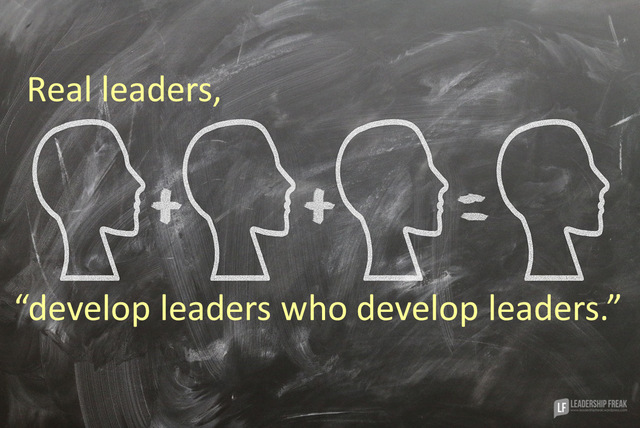 Stop saying you’re a leader until you can list the people who are “leaders who develop leaders,” because of you. Leadership crisis, within an organization, means current leaders entirely missed the point of their existence. Cling to authority. Leaders who need authority, cling to it, rather than release it. Those who relish the trappings of position, view others as rivals. Work alone. In order to develop leaders you must invite them to do what you do. Protect their turf and make themselves indispensable. Rely on telling. Leaders are developed by making decisions, not being told what to do. Constant telling makes you the boss, not a leader. Need to be smarter than others. Fear mistakes. Perfectionists can’t allow others to test their wings. Look for those who have aspirations for themselves and others. Exclude those who aren’t faithful contributors already. Tell the truth compassionately. Coddling is affirming, not developing. Welcome challenge. Team members that don’t challenge themselves and others are followers. Bonus: Become a leadership coach. Again, Out of the park! You knocked it out of the park, Dan. Love it! Especially the coddling part. I tell my folks…being compassionate means telling the truth, making it clear, and helping it stick. Nothing to add or take away. Thanks Stephanie. I find many leaders grapple with compassion and empathy. Thanks for adding your insights. Happy New Year and thanks for sharing. Thanks Mike. I appreciate all your encouragement, sharing, and support. Happy New Year and best with your team at Microsoft. WOW! What a compelling challenge for everyone aspiring to authentic leadership! Thanks and Happy New Year! Thanks Jim. I find this challenge to be the most challenging of leadership challenges, after self-leadership. Can you give some insights about self-leadership? I found three areas for my own growth as a leader: Tell the truth with compassion, Make room for consequences, and Welcome challenge. I will use these elements as I prepare for annual reviews with my team. I will also share with fellow leaders. Thanks for the reminder about the Kouzes and Posner fundamental leadership behaviors. As a leader in higher education, those are two names that my colleagues will identify with. They have the respect of the research community. I needed this challenge today! Thanks for the insight. Really I was looking for such kind of blog who talking for exponential leadership. I could give credit to you because you touched my life’s few aspect and your appreciation on my comments are compliment for me. Still few things are creeping in organisations like behaviour based productivity related issues and their current line managrs are more focused on problems and should not forget such managers keep addressing personal problems during reviews. These two issues keep increasing in all organisations. Current climate survey of Google hyderabad is the example or in manufacturing units it’s normally happened events . Once you we are able to correct such problems then exponential leadership starts. So gap lies at top and middle management’s? Here we need exponential leadership needed. Once it’s happened Dan belive me first miracle of this century would be in place. Successful organisation or better work place never have such kind of gaps or they are able to bridge it successfully. Great post, Dan! I think in education we see the teacher leaders emerge due to you one point… leaders don’t work alone. Teaching can be so isolating, with the tradition of “close the door and teach.” I see leaders emerge through collaboration and a desire to uplift others. My goal is to open doors for emerging leaders, model collaboration, challenge & motivate, be empathetic, and speak truth. I learned early as a supervisor to “ignore the organizational chart” and provided leadership opportunities to my subordinates not consistent with their title or rank and it definitely helped them develop as leaders. Great advice, Dan. Thanks! as a contribution to the conversation, check out excerpts from GREEN LIGHT LEADERSHIP for School Leaders!